multiple pages. A link to the second page can be found at the bottom of this page. Sugar Crisp was the first sugar-coated cereal. Dandy, Handy, and Candy (~1949 through 1960) were three identical bears who loved Sugar Crisp. They were illustrated by Dan Winsor, who also drew the comic strip series from 1951 to 1954. Benton and Bowles Advertising handled the Post Sugar Crisp account at the time. Three, 3-foot-tall, costumed midgets (2 men and a woman) promoted Post Cereals in 1951 and 1952. The trio became the title subjects of the popular song "Dandy, Handy, and Candy" recorded by Rosemary Clooney. Over a 10-year period, R.C. Traverse eliminated 2 of the 3 bears. First, by making 2 of the 3 bears secondary (smaller on the box) and then eliminated them outright. By 1960 there was just 1 "sugar crisp bear". Here's an introductory 1964 version of Sugar Bear (at left) and a more familiar 1965 version at right. Sugar Crisp was described as a "honey flavored puffed wheat" cereal. Illustrated by R.C. Traverse. Born in 1963, the cool, wisecracking Sugar Bear will go to great trouble to get his cereal, while Granny Goodwitch does her best to keep it from him. Super Orange Crisp (1973) was like regular Sugar Crisp with orange fruit rings added. Pictured above in his famous pose from the 1969 cereal box. "Can't get enough of that Sugar Crisp... Sugar Crisp... Sugar Crisp... Can't get enough of that Sugar Crisp... It keeps me going strong". At one time, in the 1970's "Sugar Bear" was renamed "Super Bear" when sugar was banished from most cereal box titles. Sugar Bear has been voiced by Gerry Matthews since 1963, and as of 2005, he was still lending his voice for ads in Canada. Illustrated by R.C. Traverse and Ray Favata. Another slogan for Super Sugar Crisp: "It's a honey-sweet vitamin treat". Additional villains, not listed individually on this page, include: Mean Mr. Winter. Grannie (circa 1965, and voiced by Ruth Buzzi) did her best, but always failed, to keep Sugar Bear away from her Sugar Crisp, which is made up of "big puffs of wheat tumbled through hot sugar and honey". Sugar Bear was really quite a bother. "It's a honey of a snack, you know". "Tastes like 101 sweet buns". She routinely sought help from Sugar Bear and would want to reward him with a kiss, which he always avoided. The character was created by Ray Favata. Mrs. Sugar Bear appeared in at least one of Sugar Bear's commercials in the 1960's. Venerable Jarvis (circa 1998) was a butler. He worked for a rick family called Richest Robeson. He was out to steal all the family's riches and cereal in their home. Victor Vicious (the mad vitamin stealer) and his Vicious Gang (of 3 vitamin thieves) attempted to steal vitamins (what else?) from boxes of Sugar Crisp. Golden Crisp Bandit looks like he got his hands on some of the coveted golden cereal. 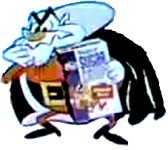 Blob (1970's) was a thief who tried to steal Sugar Crisp from Sugar Bear. It's unclear if these are really the same character. Blob spoke with a Boston accent. Blob was voiced by Second City actor Andrew Duncan. The character was created by Ray Favata. A couple different Sugar Crisp Foxes appeared in commercials. Sly Fox tries to catch Sugar Bear, but Sugar Bear was always bouncing out of danger with the box of cereal. This character was created by Ray Favata. The Sugar Crisp Beaver was one of the first Sugar Crisp characters. The Sugar Crisp Snake was one of the older Sugar Crisp nemesis characters who appeared opposite Sugar Bear. 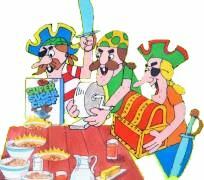 The Sugar Crisp Pirates, like other baddies, were looking to loot Sugar Bear of his cereal. Illustrated by Ray Favata. Big Benji Wolf was a friend of Sugar Bear. Benji stuttered, was dyslexic and very bashful. Mighty Mouse championed Sugar Crisp in 1957. Li'l Abner, the famous comic strip character, stomped the back woods for Grape Nuts in 1957/1958, and Sugar Crisp in the 1950's. Fred Flintstone enjoys his Pebbles cereals. 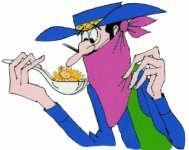 Barney Rubble puts on different disguises and always succeeds in getting the cereal away from Fred. "B-A-R-N-E-Y!" Marshmallow Mania Pebbles (2005) includes The Great Gazoo on the box. "Double the marshmallow fun". Ray Favata was one of the animation illustrators. For more information on The Flintstones, check out Warner Bros.
Cocoa Pebbles Bedrock Blizzard was essentially a reissue of the prior season's Holiday Pebbles with red and green colored puffed rice. Blizzard was "frosted with snow". (Actually, it included a small packet of white sprinkles so you could frost the cereal yourself). Dino is Fred Flintstone's pet brontosaurus. Dino Pebbles included Dino-shaped marshmallows in several colors. Bronto Brite (1997) is a blue brontosaurus who wears sunglasses. Linus the Lionhearted was born in 1962. Originally named Linus the Lion. Illustrated by R.C. Traverse. During the 1960's his appearance changed. He lost his top hat, vest, and beard, and gained a bulbous snout and became more cartoonish. Linus and most of the other Post characters of the mid-1960's appeared in the half-hour cartoon series "Linus the Lionhearted Show" which ran on CBS from 1964 to 1966. The characters from the show included Billy the Bird (voiced by Carl Reiner), Dinny Kangaroo, Granny Goodwitch, Giant (So-Hi's mother), Lovable Truly, and So-Hi. Linus the Lionhearted was voiced by Sheldon Leonard. Crispy Critters, "The one and only cereal that comes in the shape of animals", was a sugar-frosted oat cut out in animal shapes. In some later boxes, the cereal box featured the addition of Pink Elephants, Orange Moose --- the color of orange, and Grape Apes. In 1967 and 1968, White Pushme-pullyous were featured as a tie-in with Dr. Dolittle. The cereal inside the box was not as colorful. Crispy Critters was reissued for a limited time around 1988. There was also an unfrosted variety available. Orange Moose was once added to Crispy Critters (circa 1960's). He was paged in song "Call for Orange Moose, call for Orange Moose. Critters now have Orange Moose..." (the melody was from the song "Camptown Races" doo-dah, doo-dah) for a phone call. The music would stop. Then, as soon as he answered the phone, the rest of the animals stampeded across the screen over him and you heard the usual "the one and only cereal that comes in the shape of animals!" Crispy (1987) looks something like a golden teddy bear with a large nose and two short antennas on the top of his head. He has a long tail like that of a lion. He sports a large ball of pink fur at the end of his tail and atop his antennas. He loves music and is either voiced by Jimmy Durante, or a darn good imitation. "Ah-cha-cha-cha!" One jingle went like this: "Hello my name is Crispy, how do you do? Crispy Critters cereal's entirely new. Its indubitably, indubitably, delicious! Oh here come Crispy Critters, a good, wholesome bunch! The low sugar cereal, with lots of crrrunch! Its indubitably, indubitably, indubitably, indubitably delicious!!" Animation by Dean Yeagle. Blue Bear (1968) appeared on an experimental Post Crispy Critters cereal Bunger Spout box which opened on the side of package. Vincent the Vulture (1964) appeared in ads for Post Crispy Critters cereal. So-Hi (1960 to 1968) is a young Chinese boy. The little fellow got his name as a result of being only "so high". Voiced by Bob McFadden. So-Hi was replaced by Krinkles the Clown in 1969. 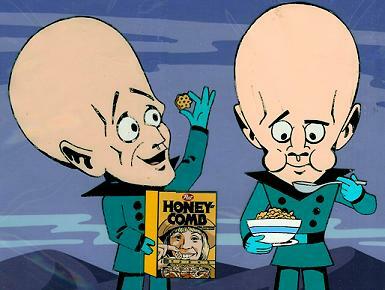 The Honeycomb Kid (1965) rode for the great taste of Honeycomb, a corn and oat based cereal. Illustrated by R.C. Traverse.Does anyone know the name of his horse? The Honeycomb Kid was reincarnated in 1999 on a foreign box of Honeycomb. This time around, he's younger, stronger and sports an "outdoors" look. Crazy Craving is an immediate hunger for Honeycomb. Other characters have appeared opposite kids in a treehouse. The kids make the other characters chill-out by offering them Honeycomb cereal. "A big-big bite". Strawberry Honeycomb (crunchy sweetened corn and oat cereal with natural strawberry flavor) was offered at one time. Disclaimer: This is a non-commercial site with the sole purpose of assisting visitors in locating information on their favorite breakfast cereal characters. All of the names, characters, brands, and icons listed here are trademarks of Post or their respective parent companies and cannot be used for commercial purposes. The Pink Panther icon is courtesy Dave Schutz at Alikchi Graphics (Alikchi@aol.com). Enjoy Post cereals and support your favorite characters!